What distinguishes a bird of prey? They have exceptionally good vision, a sharp, hooked beak, and powerful feet with curved, sharp talons. 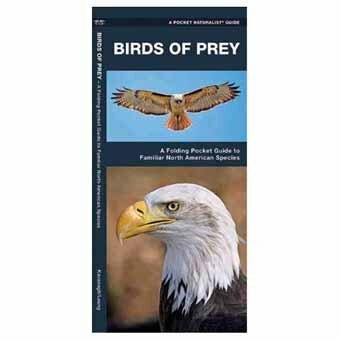 Birds of Prey is the perfect pocket-sized, folding guide for the raptor lover and nature enthusiast. This beautifully illustrated guide highlights almost all North American species perching and in flight. Created and printed in the USA, this guide was updated in 2012 with a new cover design and a back panel map highlighting raptor flyways and migratory hotspots Laminated for durability, this handy guide is a great source of portable information and ideal for field use by novices and experts alike.